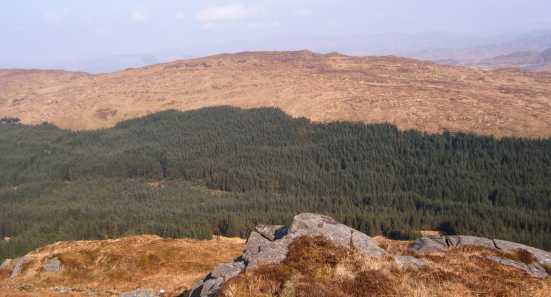 Croagmeen is part of the low range of hills to the south of the Barnesmore Gap, a bleak and remote area with the main Bluestacks to the north and heavy forest bordering to the east and south. Started from Barnesmore Gap, visiting Cruach Eoghanach first and getting a birds eye view of the expanse of hills and loughs. Dropped down past Lough Napaste and to the slopes of the neatly hidden Croaghonagh lough (036846 E). Contoured around to meet the fast flowing stream flowing from lough Namaddy - all these loughs were useful navagational aids as u can tell. A short climb brought the first of the wind turbines of Barnesmore Windfarm (run by Scottish Renewables, with the same signage as that at Colin Top in the Antrim Hills). This was fittingly cold and grey to go with the leaden sky and bleak landscape. Followed the rough gravel track winding through the widely spaced gaggle of turbines (24 in all) to reach the sizeable jigsaw pieced lough Golagh. The track skirts the lough but i followed its shore east, enjoying the peaceful waters - no fish but no midges either! There is a whole lotta forest to the east towards the foothills of the Sperrins as reach an electric substation converting all the power of the wind and carrying it away to be used by us civilised people. Reach the southern tip of lough Slug (031818 F) and the track bends south to reach the slopes of Croaghmeen - a low hill with a distinctive bump, actual top another bump further back. Nearly dark so had to wait til morning for views as set up camp beside nice little lough just below top. Some 6.5 miles and three hours of walking to reach here. PS views are fine - taking in high Bluestacks to north, low lying civilisation reaching to coast to west and the large area of land which is either brown with hills or green with forests. Cannot help but wonder how more lost one could feel if man hadn't driven roads into the heart of this wild area to exploit the natural resources. That said there was no one on these hills - though did meet a couple of people using the track to the windfarms.